At first, Susan Harris’ The Golden Girls would not seem to have much in common with Mitchell Hurwitz’s Arrested Development, other than the fact that they’re both half-hour situation comedies set in warm climates. One’s multi-camera and sincere. The other is single-camera and awash in irony. But maybe these two shows share some DNA after all. Consider, for instance, that Harris’ previous show, Soap, is an important predecessor of Arrested Development. In many ways, the trials and travails of the hapless, scandal-prone Tate and Campbell clans presage the misadventures of the Bluths several decades later. So if Arrested Development and The Golden Girls are not exactly siblings, they are at least first cousins once removed. And, ultimately, both Arrested and Golden are about the conflicts that arise when eccentric people are put in close quarters and simply have to deal with each other. A mashup like Golden Development is already starting to make a lot of sense. One quick joke that flashes by during Betty White’s credit is that her character, Rose, is identified as a “gerkonanaken.” This is one of the show’s many invented expressions from Rose’s hometown of St. Olaf. The explanation of what it means is pretty damned hilarious, but it’s best to let White herself tell it. 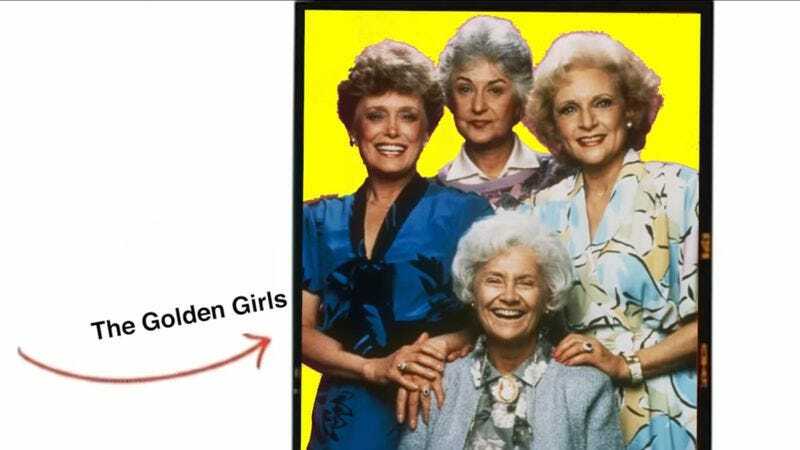 The folks at Stay Golden, who promise that a webseries by that name is in the works, have created a whole slew of Golden Girls parodies and mashups. The channel is a veritable cornucopia of Golden goodness. Offerings there include a series of videos called Drunk Golden Girls. And there are plenty of mashups with other series, too, including the original Star Trek. It turns out that The Golden Girls is like a good table wine that pairs well with just about everything.